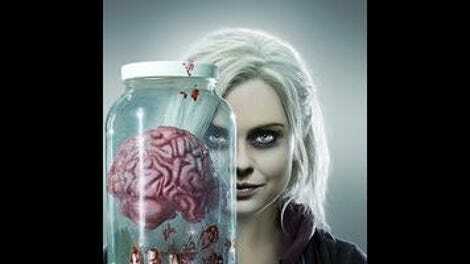 By the end of season one, iZombie had blown up everything in Liv Moore’s life. Her best friend had disappeared to parts unknown, chased away by finally learning Liv’s secret. Her ex-fiancé was no longer speaking to her after she turned him into a zombie without his consent (even if she did quickly use the last of the cure on him). The zombie cure was gone, with no way to easily make more. Worst of all, she had to refuse her chance to help save her brother’s life by giving him some of her blood, because revealing to her family that she was a zombie was the more dire of the two options presented to her. The final shot of last season was like a metaphorical door closing on all of the hope Liv had left, and to iZombie’s credit they don’t forget about this when the show returns for its season two premiere. Liv is still very much in the muck, and judging by this fantastic season two premiere it’s a damn pleasure to be stuck there with her. That’s not to say the show doesn’t have a little fun playing with our expectations at first. The episode kicks off in the same hospital hallway where it ended, and at first glance appears that no time has passed. It isn’t until Liv’s voiceover kicks in that we realize it’s been three months since Liv had to refuse her brother blood, and both he and her mother are still not speaking to her over the decision. It’s a raw, emotional gut punch but also simultaneously an interesting moral conundrum that defines all of Liv’s choices as a character up to this point. Is it really better to alienate her family in order to protect them from her secret? Or would telling them, giving them the explanation they so desperately want, eventually be the better choice? From Liv’s perspective, Ravi is the only person in her life who reacted to the news with any sort of acceptance, so keeping it hidden and taking the emotional penance of this choice is part of the deal; as she intones, she’s “a monster” and she needs to harden herself and act like one. This is easier said than done, as the rest of the episode proves. Maybe the best thing about the premiere, however, is how deftly it is constructed to establish where all of the main characters find themselves after the three-month time jump. Once Liv’s emotional status is solidified, the episode quickly moves to introduce its case of the week, which in turn provides our re-introductions to the most stable of the group, Ravi and Clive. The case of the week—this time the accidental murder of a very grumpy and frequently racist old man—is once again the least interesting thing about the episode on its face, but does a fine job of holding the episode together and serving as a more comedic buffer between all of the far more serious things that surround it. As the show gets deeper and deeper into its mythology, the cases have to take on far less of the narrative load in an episode, and that has only worked to their benefit as iZombie has evolved. As for Clive, he may be one of the more static characters, story-wise, but he certainly is making steps toward becoming less static, as he has his doubts about what went down at the Meat Cute in the finale. The story of Lt. Suzuki’s heroism to him feels like just that—a story easily swallowed by the department to close the case and avoid looking any deeper. Clive’s suspicions fall squarely on Major’s shoulders, and he peppers Liv with questions about Major’s alibi in an attempt to get her to slip up and admit he wasn’t with her at the time of the murders. Liv blows him off, but warns Major that Clive is on to him. What Liv doesn’t know is that Major has far deeper problems, problems Clive’s interest in him will only make worse. Of all the characters on iZombie, Major is easily the most changed from the pilot and arguably had the most interesting character arc in season one. The culmination of his arc—the outstanding Meat Cute sequence scored to “Der Kommissar”—is revealed to be only the tip of the iceberg here, as Major is forced into an even more compromising situation by Max Rager. Any agency Major felt in the finale by killing the zombies he hunted all season was quickly taken away, first by the devastating revelation that Liv was one of them, and second when she was so willing to turn him into everything he hated for her own potentially selfish reasons. The Major of season two has nothing: No job he adored (he’s now a personal trainer, which, well played, show), no fiancé, and no discernable future path. The Major of season two listlessly trains Average Joes who confess their pizza sins while wistfully looking at the kids he used to be able to connect to and help. This would be simply depressing, but the reveal that a cured zombie develops some sort of zombie ESP (zombiESP?) puts Major in an even more compromising position when head Max Rager evildoer Steven Weber brings Major in and offers him an ultimatum: Eradicate Seattle’s zombie problem and we won’t turn you in, and maybe we won’t kill your zombie ex-fiancé. (But don’t hold him to that last bit.) Now Major is skulking through the night, nabbing what appear to be perfectly law-abiding zombies, shooting them in the head, and then dumping them into rivers, put in an impossible situation and doing all he knows to do to get out of it. He went from a man with a mission to a man forced to kill for hire—all so the disgusting Max Rager won’t lose any of their billions of dollars in profit—and all while Clive is on his trail. Liv may be emotionally defeated by the events of last season’s finale, but Major is utterly broken by them as a person. How long until he completely breaks in two? If Major is the depressing, dark center of the premiere, Blaine is the snarky, sparkly edges. If there were any concerns that Liv curing Blaine in the finale would somehow make him lose his edge, those are mitigated almost immediately upon his appearance here. Not only is he now running a funeral home (to get brains for his clients) but he’s also running a massive Utopium operation out of the basement as well. There’s a maybe five-minute section of the premiere that is simply Blaine vamping and Liv looking on and scowling, and it is absolutely the most entertaining part of the entire episode. Curing Blaine didn’t remove him as Liv’s biggest antagonist, and it certainly didn’t remove Blaine’s desire to see harm come to Major, so there are a lot of places for his character to go even if he did return to one of the living. Having him be human is almost a better way to integrate him into stories, as he’s no longer the obvious outward threat he was in season one. And, let’s face it, more David Anders is never a bad thing. Overall this is an extremely strong way to kick off season two, setting up multiple interlocking story threads and hinting at what appears to be a deliciously dark season two, while still maintaining the humor that was so important to the show’s identity in season one. 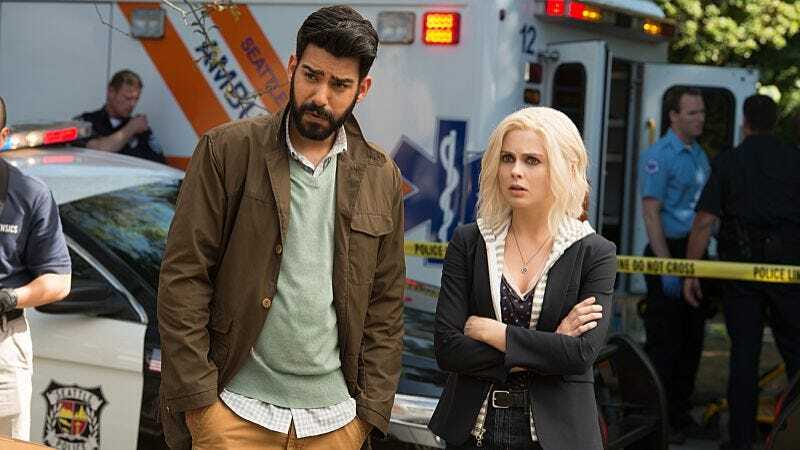 One of the most rewarding things about watching an episodic television series is seeing it grow and get more interesting and complex as it progresses, and iZombie certainly continues its upward trajectory in this premiere. I’m looking forward to what looks like a great season to come. Liv’s new roommate is secretly the Max Rager assistant! Come back, Peyton, we need you! The opening sequence is just great, dissolving from Liv’s depressing intonations about being a monster to the atmospheric and creepy sequence of the jogger listening to The Hooters’ “All You Zombies” and overhearing bloodcurdling screams in the background. These little sequences are one of my favorite things about the show. Liv’s running feud with the sketch artist is my favorite thing. Rob Thomas is great at world building through small recurring characters. Rob Thomas also loves a familiar face returning in an unexpected way: Scott E.’s twin Don E. is Blaine’s drug connection and the one who knows who cut the tainted Utopium. The cured zombie rat’s name is New Hope, which, ha. “Hey, Archie Bunker: I’m of Asian descent.” Liv taking on racist personality traits isn’t my cup of humorous tea but this Ravi reaction line is perfect. That being said, the line she had to deliver to Clive about him being “one of the good ones” takes it way too far. Saying these things to Ravi is one thing, but Clive doesn’t know she’s being affected by racist brains. Now he has to work with someone who he thinks has racist tendencies or is a flat-out racist? That doesn’t really work for me. Speaking of Clive, I want an episode from his perspective where we get to truly see how he processes all of Liv’s weird personality shifts. He must think she’s absolutely bonkers. “Your t-shirt is stupid. That’s meant to be literal.” Rose McIver absolutely kills this line reading.